Stormy Seas is the thirty-second level in the Game Boy Advance version of Donkey Kong Country 3: Dixie Kong's Double Trouble!. It is also the second area of Pacifica. This level is set on a series of boardwalks and takes place in the middle of a storm, complete with many waves in the water. However, this does not have any affect on actual gameplay. Krackas, enemies never found in the original Donkey Kong Country 3, make their first and only appearance in this level. Enguarde the Swordfish can also be found underneath the Star Barrel in this level to help the Kongs tread through the dark-blue water. Other enemies that can be found here include Sneeks, Re-Koils, Lurchins, traditional Knockas, Kocos, Bounty Basses, Klasps, Buzzes, and Bazzas. A Nibbla makes an appearance in a Bonus Level as well. At the beginning of the level, the heroes travel under some roofs, supported by strong stilts, and walk down a few slanted pathways to find a small gap of water. They must cross it and head through another tunnel, entering the water afterwards. In the ocean, they find the letter K, and then get back onto the wharf to meet a Kracka. Moving on, the apes trudge along some more straight or slanted boardwalks to find the letter O on top of a tunnel. After that, the monkeys drop down from a ledge, finding two more Krackas. They need to dodge both and continue forward to pass three Sneeks, as well as find the Star Barrel. About halfway into the level, the heroes walk across more of the wharf to find some tightropes. Climbing across to avoid the stormy, enemy-filled ocean, they dodge the land foes, Buzzes and Klasps. Once they get back on the boardwalks, the apes make their way under a tunnel to find another set of horizontal tightropes. Again, they should be used to cross the wavy ocean below. While climbing across the ropes, the monkeys jump between two green Buzzes, whom they must make sure to avoid. Hopping off of the tightropes, the monkeys head under yet another small tunnel and meet the border between the wharf and the water. They must swim through the liquid and pass the No Animal Sign, which makes Enguarde disappear if he was used. Leaping up some ledges on the wharf, Dixie Kong and Kiddy Kong will find two Banana Bunches under a Kracka-surrounded tunnel, and then head across a straight set of boardwalks to spot some more tightropes. As usual, they must be used to cross the dangerous waters below. After dodging all the Buzzes around the tightropes, the Kongs head along another set of boardwalks until they find some small tightropes, supported by stilts that progressively become higher. 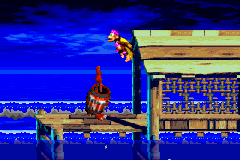 Hopping rope-to-rope over the ocean, they soon end up a a high area of the wharf and avoid several enemies. After traveling over some boardwalks and passing through a small tunnel, the monkeys find a flagpole. Raising its flag ends the level. After passing the letter O, the Kongs must inspect the wharf. Near a ledge, they find a small crack. Once this is spotted, Dixie must throw Kiddy onto the crack and break the wood, creating a small opening. If the heroes fall into the hole, they find a Bonus Barrel, which leads them into a Bonus Level. There, the monkeys move along a tightrope, collecting green bananas and avoiding a Nibbla in the water. As they grab the bananas, they also have to watch out for a fast-traveling Klasp. After enough green bananas are collected, a Bonus Coin appears at the end of the stage. At the end of the level, the heroes must jump off of the wharf and swim to the bottom of the area. Entering a narrow passageway, they make their way into a Bonus Barrel. It takes them to a Bonus Level, where they have to climb on some Klasp-infested tightropes to jump over a wall of three green Buzzes. Once they reach the end of the stage, they win a Bonus Coin. Not too far before the flagpole, the Kongs meet the Koin, who has the DK Coin. They need to defeat him to get it, however, the enemy's shield protects him from most attacks. So, the monkeys must climb to the top of a tunnel immediately before the flagpole with their Team Up move to find a Steel Keg. With the barrel, they must stand on the Koin's shield and throw it at the nearest wall. The steel barrel will bounce off of the wall and soon hit the distracted enemy in the side, defeating him, and thus giving the monkeys his DK Coin. This page was last edited on April 10, 2019, at 13:44.